1956 photo of six sisters dressed for church and arranged by age is a Kodak moment that brings back fond memories for Adrienne Stacey. Being the youngest of the six, she was sent outdoors to play more often than asked to help with housework. Her time outside was spent peering down into natural fairylands of moss and twigs or small pools of water. Adrienne's home and studio are now in Southeast Portland. Adrienne Stacey's roots and the roots of her artwork both are set in an old orchard above the Coweeman River in Kelso, Wash., where she spent her first 20 years. "My work is directly connected to the earth for inspiration, to the soul for guidance," she said. "Our home was close to the woods and, of course, close to the water. The best memories I have are of roaming the woods, rowing the river and being surrounded by the security of my family." In seventh-grade art class Adrienne found a new outlet for her creativity  clay. "Drawing couldn't hold me," she said. "With clay I could work three dimensionally. I liked working on pieces that I could shape with my hands or a tool, that took several days to make, took time to dry, took time to be fired." A piece goes through several phases before it's finished. After Adrienne shapes the clay, either on the potter's wheel, by hand, with a rolling pin, or all three, it has to air dry. It's then put into an electric kiln and fired to 1,800 degrees, usually taking a day to fire and a day to cool. The piece is now halfway to its stoneware finish. "Next I put a glaze or an oxide on the piece to give it color and function," she said. 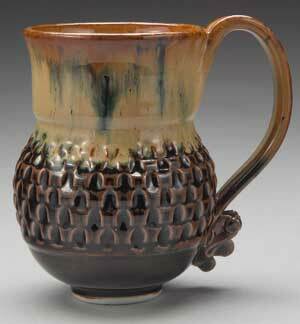 "The glaze is made mostly of silica and when fired turns to glass. Chemicals like cobalt, iron oxide, chrome or copper are added for color  blue, brown/black, green or red. After the piece is glazed, I put it into my big kiln, a 25-cubic-foot gas-fired kiln made with K-26 fired brick, and fire to cone 10, which means around 2,400 degrees. "The intense heat, plus controlling the amount of oxygen and gas, causes a molecular exchange in the clay and between the glaze and the clay," she said. "In a very real sense they become one. 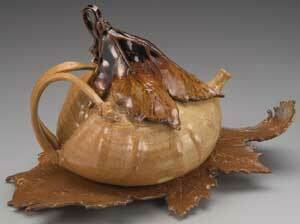 This exchange causes the piece to become rock hard or stone-like, thus stoneware." These pieces can be put in the microwave, oven and dishwasher. They're lead free and can be used with food and drink. However, they cannot be put on a burner or over a flame, as intense heat in one spot will cause the clay to expand and break. 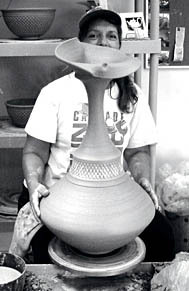 When a piece is complete, Adrienne gives it a good once-over, then usually lets it go. She rarely keeps a piece for herself; even what she calls "seconds" find homes. "I hate throwing away bad pieces or seconds, so a number of people have really ugly pet watering bowls or super-heavy vases or handleless mugs," she said. Each spring Adrienne shows her work at the Oregon Potter's Association Showcase; summer includes the Southeast Art Walk and one or two other shows or fairs. This month she participates in Portland Open Studios. "We have 93 artists showing their work in their studios the second and third weekends of the month," she said. "The experience is much more than a show for me. It has brought the most diverse visitors I've ever had. People are respectful, yet curious." Saturday, Oct. 16, Adrienne will open her kiln so people can see all the joys and sorrows that come with the process of making and firing her work. The following day she'll demonstrate, usually on the wheel. She'll average about 100 people each day, with several coming back for classes or inviting her to participate in an event they're planning. "When I travel to other cities or countries, I love being able to see and buy locally made quality products, including artwork, clothing, food and wine," she said. "Being able to go to someone's studio, meet them and watch them work is always a special experience, so I'm happy to be involved this way." In grade school Adrienne's favorite class was art; in high school it was pottery. Every year she entered various items in the county fair, once winning a blue ribbon for her pottery. A first place at the local annual art show followed. "As I think about how I was influenced by the art of my family, I realize my mother had a natural eye for color and composition," she said. "I know this from the way she decorated our home and used her flower garden to dress up a room with delicate bouquets of columbine, lilac and tiger lilies." One of Adrienne's sisters is a substitute art teacher, another majored in art and most of them sewed creatively. Her father took up oil painting and pencil and charcoal drawing after retiring from the family business. 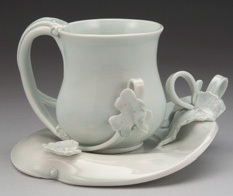 At Marylhurst College, Adrienne majored in art with a concentration in high-fired ceramics. "Because of the art major, I tried drawing, painting, graphic art and print making, but not sculpture or large art projects that would go with architecture," she said. "The Holy Name Sisters who shaped the college were surprisingly anchored in social justice and leadership for women. The year I started, they hired a pottery teacher and created an excellent program in ceramics. "I studied two years under Wally Schwab, one of Portland's exemplar functional potters, and two years with Patrick Horsley, nationally known for his amazing turquoise slab-built teapots with handles that take you places handles generally don't go." While in college, Adrienne worked for Richard's Pug Mill, a ceramics supply store, where she also taught classes and set up a small gallery of her work. She got married at the end of her junior year, then moved to Eugene after graduating when her husband decided to go to the University of Oregon Law School. Adrienne was drawn to the town's newly formed Saturday Market. "It was wonderful, perhaps a bit more practical than today's market," she said. "I remember walking down the street and realizing that everything I had on, except for my underwear, was from the Market  hat, dress, shoes, purse." 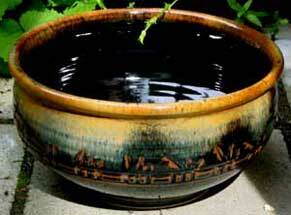 Adrienne made and sold high-fired, wheel-thrown, functional pottery. During this time she chained herself to the wheel and threw mugs, plates, teapots, flower pots, sets of dishes and mastered the quality of repetition. When her husband graduated, they moved back to Portland, had a baby and bought the house they still live in. 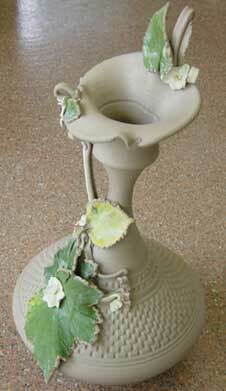 In 1977 a second daughter arrived and for the next 10 years Adrienne maintained her clay work. "I knew I had to be true to the discipline of working several days a week with clay," she said. "We managed to build a studio and kiln right away, and I worked on improving my forms." Adrienne's goal was to become dexterous on the wheel. Slowly, hand building crept into her work. "I found myself watching for accidents that I fixed by bending or twisting the clay out of the regular wheel shape," she said. "Soon I was adding handles as accidents instead of function. I began carving leaves into the clay. I painted bamboo, irises and wisteria onto my functional white ware. "I started having a booth at the annual Wild Arts Festival, a fund-raiser for the Portland Audubon Society. I came up with more nature themes; the most popular by far were three-dimensional leaves added to a piece and clay leaves by themselves." Adrienne's work was greatly influenced by this process. The leaves taught her to look at their composition and environment. Soon she was designing her garden to provide not only the leaves for her work, but also a healthy environment for raising them. "I'm an organic gardener now. Plus I am deeply in love with earthy creations," she said. "My pottery designs are becoming more sculptural and less functional. The shapes are undulating, rounded, detailed and feminine. Colors run from black to white, mossy to woodsy and to kitchen yellows and greens. 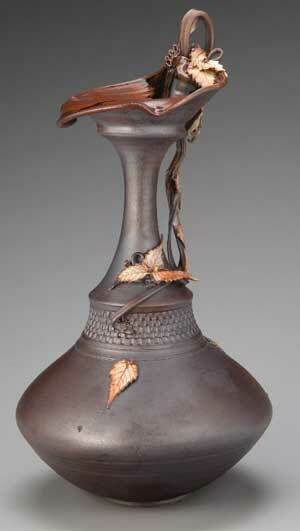 Because of the high-fired process I don't get the brilliant colors of myolica or raku. My colors are muted and varied, and seldom are two pieces alike. "I'm fascinated by composition but have little confidence in creating realistic scenes, sculptures or painting with my work," she said. Having to rebuild their tumbling-down garage two years ago, Adrienne now has a practical and wholesome new studio. It was big enough to hold students and she began teaching classes. "My initial goal was to teach the way I'd have liked to have learned," she said. "I watch myself teach and, for the most part, feel I respect everyone who comes to learn. I celebrate every time a student reaches a goal. "I want to build a community of potters who work and get healed by their work." 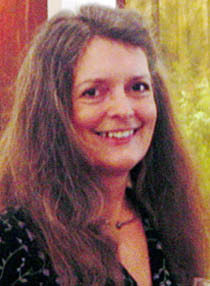 E-mail Adrienne at adriennestacey@mac.com and visit her Web site. You can reach Kathy at kanderson138@comcast.net, and draw on other Sketch Pads.